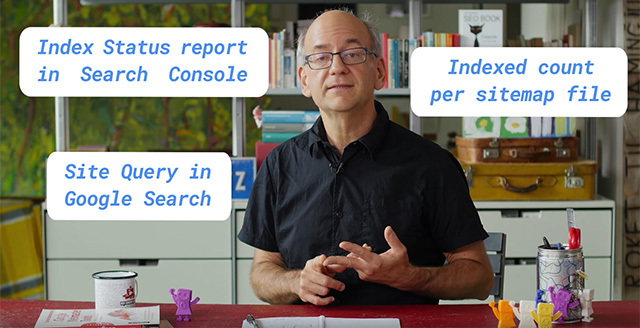 Google has published yet another novice/beginning SEO video around what metrics Google has available to measure your index count in Google, i.e. the number of pages Google indexed from your web site. As you all know, there are three primary ways to do this, including the site command, the Search Console index status report and the Sitemap report. Google has forever told people not to use the site command and stick with the Search Console report. Here is John Mueller from Google explaining it in the SEO Snippets videos series. Today's question comes all the way from Brazil. Macau asks, why is a number of pages indexed on Search Console different than what appears on google.com? Depending on where you look you might see different numbers for your site's count of index pages. Which one is the right number and which one should you use? The actual number of pages on a website is surprisingly hard to determine. At first one might assume that it's just a matter of counting through the pages starting with the home page and following the links from there. However on most websites there are many many ways to reach a specific page. There might be different URL parameters, so everything after a question mark in the URL that lead to the same page. Sometimes upper and lower case URLs also lead to the same page or perhaps you can add a slash to the end and still get the same page. Some websites have a calendar or something similar that leads to an endless number of new and valid pages. Assuming that most websites have an infinite number of possible URLs should Google just show an infinite count? That probably isn't that useful. So which numbers can you see and where do they come from? There are three main places to get counts for the number of indexed URLs. First you can check a site query in Google search. Second you can use the index status report in Search Console. Or third you can look at the index count per Sitemap file. Let's take a look at these options. In Google search you can just enter site and then a colon and then your domain name. Google will show you a sample of the pages index from your website together with an approximate count of the URLs on your website. This number is generally a very very rough approximation based on what we've seen from your website over time. We try to show search results as quickly as possible, so that count is optimized more for speed rather than for accuracy. It's useful to look at this as a very rough order of magnitude but we don't recommend using that count as a metric. The second and third methods require that you use Google Search Console. Search Console is a free tool you can sign up for and verify your website with. In Search Console there's a report that shows a number of indexed URLs from your website. This count is much more accurate and includes the actual index URLs from your website. It's mostly based on pages that have unique content, so it would usually exclude URLs with irrelevant URL parameters for example. However it can still include many URLs that you don't necessarily care about. The third place to check is a sitemaps index URL count. Per sitemap file that you submit you can see how many of those URLs were actually indexed. One thing to keep in mind is that this count is based on the exact URL as specified in your sitemap file. So if your pages content is indexed with a slightly different URL then that wouldn't be counted there. In practice, we recommend either the sitemap file or the index URL report in Search Console as a basis for your website's metrics. These are currently the most accurate indexing numbers available to site owners. I love that Google is doing these but I am looking forward to some of the more advanced Q&As.